For over a decade now, the fundamental unit of content marketing has been the blog post. Your post may be a block of text, an infographic, or a listicle about memes, but the underlying structure is the same. A regular cadence of posts to the company blog is the foundation of most content marketing strategies. The problem is, each individual blog post has only a small window of effectiveness for SEO. A post might go viral, get hundreds of shares, and then sit in your archives for eternity. Identifying and promoting evergreen content can get more mileage out of a good post. But by nature and design, these posts aren’t built to be an enduring SEO resource. Think about it: When was the last time you clicked through on a blog post that was over a year old? That’s not to say you should stop blogging altogether, of course. Blogs generate subscribers, help promote gated assets, contribute to thought leadership—all worthwhile goals for content marketers. But as SEO continues to evolve, it’s time for new models of SEO-driven content. At TopRank Marketing, we’ve been working on a new way to integrate SEO and content to build longer-lasting, more valuable resources. Essentially, it’s reverse-engineering evergreen content, purposefully building well-supported “tentpole” content with SEO baked in. 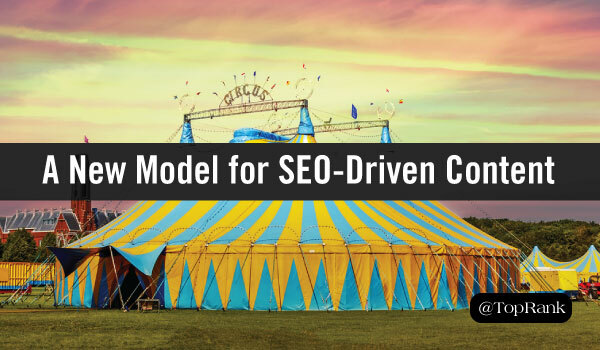 Here’s how to design a content strategy I’m calling the “Big Top” model. The tentpole content is the big asset that the rest of your strategy will be supporting. It should be a comprehensive take on a single topic relevant to your business and your audience, one with plenty of opportunities to crosslink with supporting content. Research topics and keywords for your tentpole the way you would any best answer content: listen to customers, evaluate competing content, and use tools like Bloomberry and UberSuggest. A tentpole should be between 1500 and 3000 words. Your tentpole will cover multiple aspects of your topic, divided into 250-300 word sections, each section based on long-tail keywords. This last one is key. Your tentpole will not live on your blog. It should have a permanent place of pride, preferably not more than two clicks deep into your site, with a short URL. A “Resources” section is the ideal place. You can break up the sections in your tentpole with eye-catching visuals, embedded SlideShare or video content, even CTAs to gated content. Your tentpole is a prime location or influencer engagement as well. Curate quotes from influencers to highlight in the text—or, better yet, reach out to influencers to co-create and cross-promote the content. You don’t have to limit your strategy to a single tentpole, either. If you have multiple topics that you can cover in depth and at length, create a pole for each one. Each stake should have a CTA to the tentpole. If you have anchor links for navigation, as in our example above, you can also link to specific subsections that are relevant to the post. Guylines connect the stakes to the tentpole, providing stability and structure. In content terms, that means creating links from your supporting content to the tentpole and vice versa. The goal is to create a destination that users can explore, following their interest through multiple pieces of content, back and forth from the pole. This kind of structuring provides value for your readers, and increases positive search engine signals like time-on-site and session length. As you develop more tentpoles, look for opportunities to link them together. Make sure each link is a logical next step for your reader. Over time, your “content big top” can become a full-fledged three-ring circus. These promotional efforts will build on your tentpole’s native SEO value, giving it some momentum that will help build external links and bring in organic results. The Ringling Brothers have put up their big top for the last time, but your big top content can last for years to come. Just remember to keep it relevant; plan for regular updates and revisions (which are a great opportunity to re-promote the content). The humble blog post is still a fundamental unit of content marketing. But when you supplement the blog with SEO-optimized tentpole content, the results can be… in tents. Want to learn more about best answer content? Check out these 6 inspiring examples. A Big Repurposing Scheme can make your Tentpole even stronger – turn its core takeaways into visual quotes, infographics, short videos, podcasts, answers on Quora… there are so many options to extend its lifespan. Absolutely! Spin off those smaller assets and link them to your tentpole. More guylines and stakes make the structure even stronger. Never looked at a content strategy in this way Joshua. Appreciate the insights, you definitely sparked some ideas for me that I plan to execute. Thank you! Thanks very much, John! I’d love to hear how it works out for you. Thanks for reading, John! I’m excited to hear how it works out for you. Nicely done, Mr. Nite—really like it…. I’m working for a client who I believe can benefit from this approach. Implementation starts this afternoon. Thanks Doug, great to hear from you! Hey Josh, well written article. Reading this I’m getting the sense that the SEO approach that works today is to write the highest quality, authoritative content you can, get people to see that content (especially influencers), then let the traffic and links naturally come in due to the quality of the article. My question is is there any software that helps automate any of this? Not the content creation obviously as that needs to be all human, but some of the outreach involved maybe? So maybe after you wrote something it will tweet the article to people you’re targeting, add it on various FB groups, send it via email to a few influencers, ect. Anything like that? This process seems very laborious. Great post, I’ve read a huge amount of marketing articles all over different blogs, but this is the first one to cover tentpole and stake content. Great idea! I’ve already written some tentpole content but published it in my blog. Would it make sense to transform the post to a page and set up a 301? Or should I just leave it as it is?